I am a huge reader. If you have been reading this blog for a while you know that I love to share my favorite reads. 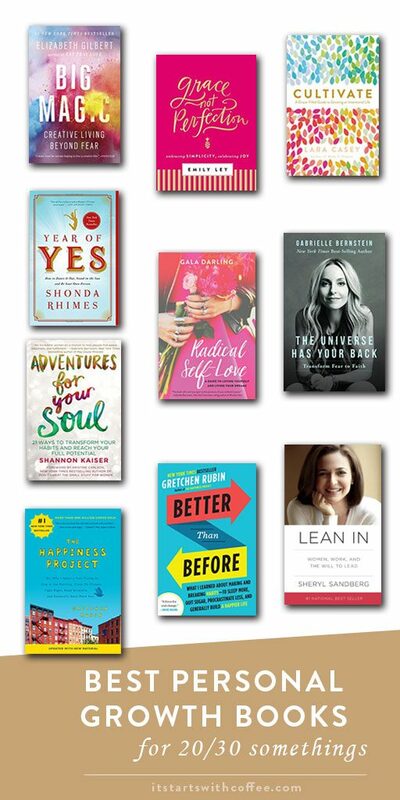 Today I am sharing the best personal growth books for 20/30 somethings that I think you will find super helpful! Big Magic is SUCH a good book. I have it on a few of my reading lists. It’s perfect for anyone in the creative field. I found The Year Of Yes to be extremely relatable. If you LOVE Shonda Rhymes and want to learn more about her life as well as how you too can have a year of yes then read this. I recently picked up Adventures For Your Soul after hearing rave reviews about it. I love reading these types of books and this was one I had been wanting to read for a long time. Having an Amazon gift card was a good time to grab it! I read The Happiness Project in 2011 and I have read it twice since then. You don’t HAVE to start it in January but if you are looking for something to read a little bit of each month it’s laid out in month form and really really helpful! I’m a huge Emily Ley fan. I love her planners and her Instagram and blog but I REALLY REALLY love her books. Grace Not Perfection was one that really spoke to me. As someone who really has always been very Type A perfectionist it was super eye opening. Radical Self Love was sent to me in a press package and I loved it! If you are someone who needs some more self-love (which we all do) this is for you! Better than Before is another Gretchen Rubin book that is a must read! It’s all about better habits and really encouraged me to change mine. Do you feel like you constantly need to have your sh*t together? Yeah we all do. But Cultivate is a great read to remind us that no one has it all together and as women we have to stop putting so much pressure on ourselves. The Universe Has Your Back is a great read especially to remind us that we can’t let fear of the unknown run our lives. Lean In is something ALL WOMEN need to read. Especially women in a workplace full of men. I would love to know if there are any books you’d add to this list of best personal growth books. I will check out that Lean In you suggest. I no longer with a lot of men but used to be the only woman in a large plant. Needless to say it wasn’t always easy but sometimes it was great too. Also, love the Happiness Project! I will put this on my re-read list. Love your picks from Gretchen Rubin – she’s great. I also want to read Emily Ley’s books. I’ve read Year of Yes and really enjoyed that too, and I don’t feel like you even have to know the author’s shows, etc. to enjoy it/get something out of it. Radical self-love sounds like my kind of book. I checked out The Happiness Project and couldn’t stick with it, but I know lots of people who swear by it. I’m going to check out Big Magic – I’ve been looking for something new to read and that just sounds perfect. Ooh! I really like some of these picks. Pinning for later! Perfect timing! I was just looking for more personal growth books. I’m reading Finish by Jon Acuff right now and it’s so good! Thanks for the list! I can’t believe I haven’t read any of these, definitely need to get on it! Thanks for sharing, I’m going to bookmark this for when I’m ready to start something else! I’ve read MOST of these, but I’ll have to check out the others too! The Universe Has Your Back and Big Magic are definitely two of my favorites! The Year of Yes is one of my favorite books. I think these books would be great for people of all ages. I am in my late 40’s and I see a few I would like to read myself. I’m also a big reader. I don’t usually delve into self help, personal growth type books, but I just might. Thanks for the recommendations. Big magic sounds fun to read for me. Thanks for all the list, will consider some when its time to buy books again. This looks like a great list of books. I am going to check a few of these out. Thanks for this; I definitely need to carve out more time to read. I’ll check out these titles. Thanks again for the suggestions! I have heard of a few of these titles before. I don’t get to read too often, but will keep these in mind, and may even see if they are available in an audio version! I think I want to check out Better Than Before. I have not heard of the book or the author, but I definitely need help focusing on building better habits. I’m no longer in my 20s. Okay, I’m no longer in my 30s, either. I do love to read, so I may just read these anyway, especially “The Happiness Project”. Cultivate looks pretty interesting. I will have to check it out. This is a good list of books to choose from.